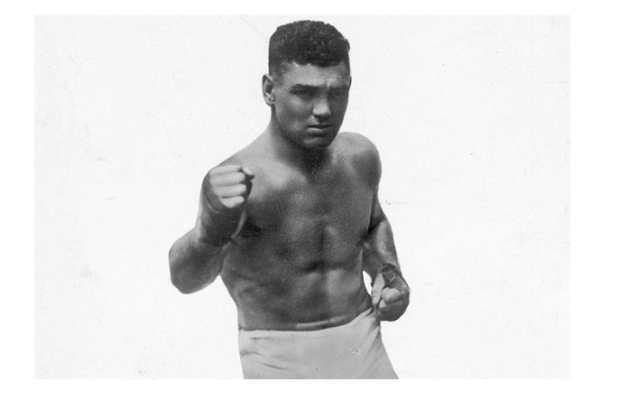 If boxing’s greatest era is that in which it was most popular, then Jack Dempsey is the fighter most identified with the sport’s zenith. 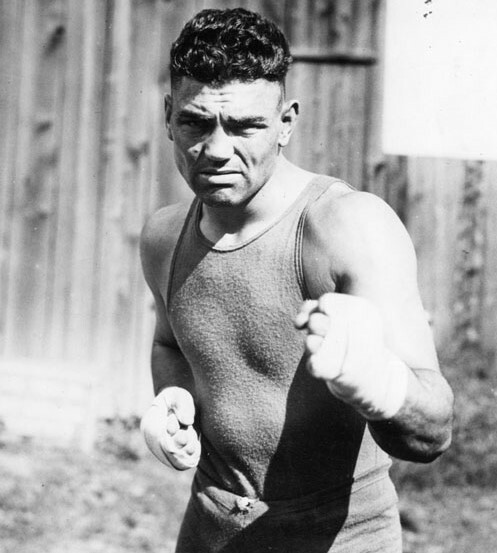 The ‘Manassa Mauler,’ whose appearance and temperament seemed to reflect the rugged Western terrain he came from, won the heavyweight title in 1919 and held it for seven years. 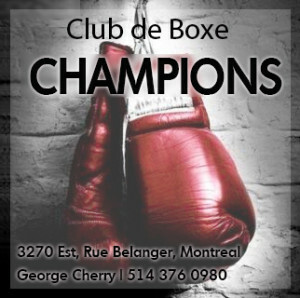 His greatest fights are some of boxing’s most famous, and his championship reign during the first half of the 1920’s defined him as a fighter whose style and personality was emblematic of a burgeoning and aggressive age. 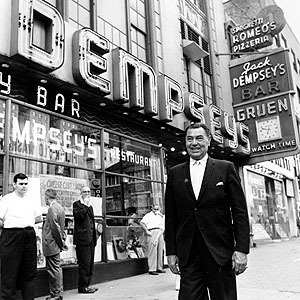 Initially spurned by a fickle public, Jack Dempsey would later become a foremost symbol of American vitality. Dempsey turned pro in 1914, participating in dozens of bouts before travelling to New York in 1916 in search of more lucrative opportunities. None came, and a dispirited Dempsey was forced to return west, where he later married working girl Maxine Cates, the first of his four wives. 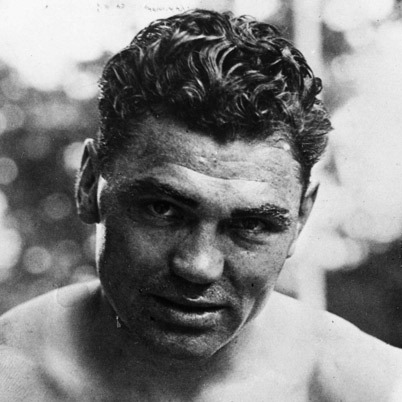 Plagued by personal missteps and family tragedy (one of his brothers was murdered around this time), his career changed for the better when he was approached by Jack Kearns, an upstart promoter who gave Dempsey the professional direction he needed. Self-aggrandizing and amoral, Kearns detected a latent greatness in Dempsey, realizing that his ferocious style and brawny handsomeness would help him become a star both in the ring and out of it. Under Kearns, Dempsey won a string of bouts and attracted the attention of Tex Rickard, the sport’s preeminent promoter. 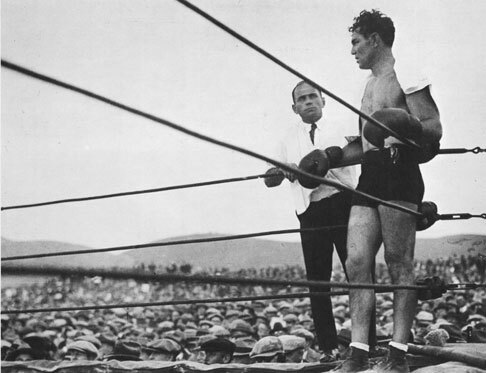 Rickard arranged for Dempsey’s chance for the heavyweight championship of the world against Jess Willard, the huge Kansas heavyweight who had knocked out Jack Johnson. Despite a striking size disadvantage, Dempsey mercilessly battered Willard, earning a TKO in the third round while gruesomely rearranging the champion’s face. So substantive was the damage that Kearns would later claim Dempsey had dipped his hands in plaster prior to the bout, thereby fortifying his already iron-like fists. Like so many apocryphal sports stories, Kearn’s tale appears completely falsified. Dempsey hovers near a fallen Willard. Despite having won the heavyweight title, the American public was loath to accept Dempsey as its top sporting figure. Fundamental to this cold reception was the fact he hadn’t fought in the First World War. 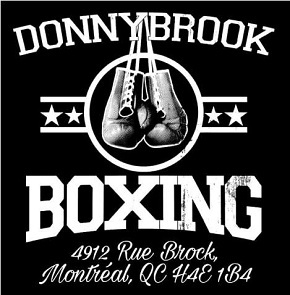 Fortunately for Dempsey, he would earn a chance to make up for this blemish on his reputation when, after successful title defences against Billy Miske and Bill Brennan, he faced the French wartime veteran Georges Carpentier. Almost 90,000 fans traveled to Jersey City on July 2, 1921 to see whether the ‘draft-dodger’ Dempsey could beat a man who’d already distinguished himself in the ultimate fight. A fine boxer, Carpentier was nonetheless obliterated by Dempsey, whose public image would benefit immeasurably from the win’s symbolic import. With Tunney down, Dempsey is slow to retreat to a neutral corner. With a brutal knockout victory over Jack Sharkey in his next fight, Dempsey received a rematch with Tunney on September 22, 1927 in Chicago. Al Capone reportedly offered to fix it in Dempsey’s favour, but the former champ refused. 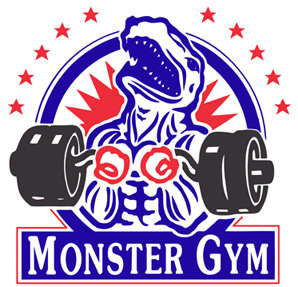 Tunney won by unanimous decision, but not without great controversy. 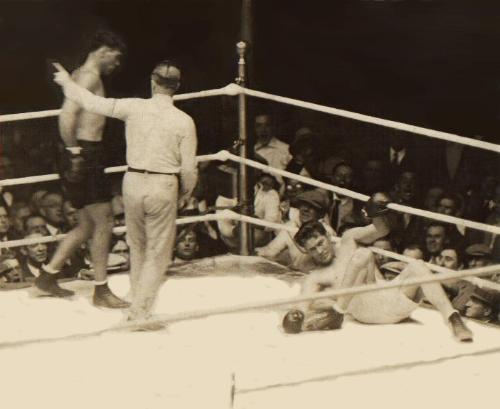 Dubbed “The Long Count” fight, the match saw Tunney floored for a full 14 seconds in the seventh round, but because Dempsey had refused to retreat to a neutral corner (a provision Dempsey’s camp had insisted on before the fight), Tunney was given sufficient time to recuperate. Gene went on to knock Dempsey down in the eighth before earning the decision. 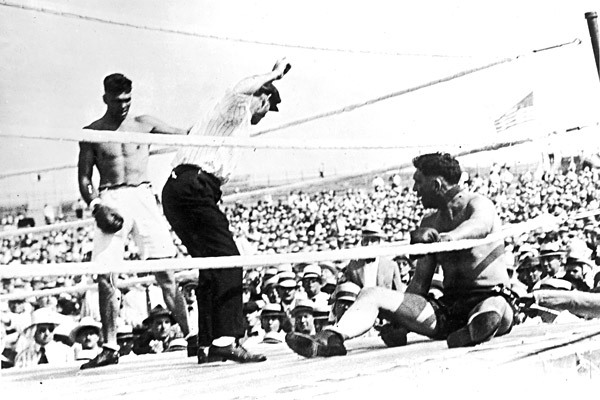 This would be Jack Dempsey’s final bout, ending a phenomenal run which saw him become an American symbol of the roaring 20’s, finally retiring with a professional record of 66-6-11. Jack outside his successful New York restaurant.